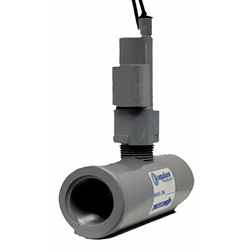 The Aqualarm Cooling Water Flow Detector is unique in the marine electronics industry, developed and patented specifically for marine engines. It activates an immediate boat alarm (not included) when raw water flow rates fall below a minimum to the engine. In polluted bays and harbors, it is quite easy to ingest debris or a plastic baggie, interrupting the flow of cool water to the engine. While heat exchanger cooled engines will run several minutes without raw water flow before overheating, during that time significant damage will be done to the engine, raw water pump and exhaust system. Monitors Marine Engine Raw Water Flow to prevent engine damage due to overheating. Activates a visual or audibile device immediately whenever raw water flow is stopped or impeded. Incorperates a two wire, non- polarity switch that is Normally Closed (Normally Open available) and opens at 1.5 GPM of raw water flow. Design for Low Flow application such as smaller engines or generators.